What is the best garage door opener for the money? With so many different kinds of models and brands, it can be a bit confusing to find the right one for your situation. Best garage door openers should meet your needs and desires at the lowest price possible. Garage door openers have made our life convenient since their invention in the 1920s. In early times, they were quite noisy and clunky. But now they have greatly improved their noise level and safety features in the past few years. They are quiet and very easy to install and use. We have reviewed 7 top rated garage door openers available on the market, according to real consumers. Chamberlain WD962KEV sports a belt drive, which is quieter than both the chain and direct drive. If your bedroom is over the garage and wants as little noise as possible, then this quiet garage door opener is perfect for you. Belt drive garage door openers have a reputation for being maintenance-free and durable. Drive belt construction has made great strides in recent decades, to the point that they’re now used on many large motorcycles. With the highest quality, Chamberlain WD962KEV is as durable as direct drive garage door openers. Chamberlain is so confident in this product that it offers a lifetime warranty. The Chamberlain Whisper Drive features a DC motor that puts out the equivalent of a 3/4 HP AC motor. The WD962KEV is capable of lifting oversized and heavy doors up to 550 pounds, although an additional extension kit may be required. Compared to AC motors, DC motors are much quieter and smoother. WD962KEV features a built-in battery backup. It can still work even when the power goes out. This system provides up to 20 open/close cycles during the first 24 hours of an outage. It also comes with two Homelink-compatible, three-button remotes. The remote will change the code each time you click the button to open or close the door, preventing criminals to hijack the signal. 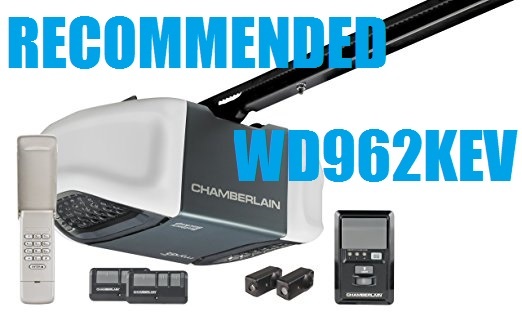 Chamberlain WD962KEV Whisper Drive Garage Door Opener is rated as the best model on the market. Buyers give 5-star reviews and excellent satisfaction ratings for this product. Chamberlain WD832KEV is an ultra quiet garage door opener. For reduced noise, it has a Motor Vibration Isolation System to eliminate powerhead vibration. WD832KEV is an ideal product for garages that have a room positioned above them. It’s belt driven and very easy to install. No extra parts needed for the installation. It’s strong enough and can open a 16’ insulated garage door perfectly. Chamberlain WD832KEV is supported by anti-burglary and security technology. In-built sensors project an invisible light beam across the garage door opening and automatically reverse the door if anything interrupts the beam while the door is going down. It’s Myq enabled. But if you want to use your smartphone to monitor and control your garage door opener, you will need to buy a MyQ Internet Gateway CIGBU. It’s a bit slow, not terribly fast. It takes about 14 seconds to open a standard 7’ 2-car door. LiftMaster’s 8500 Elite is an interesting step forward for garage door openers. The first thing you notice is that it’s not mounted like a traditional garage door opener would be. It’s attached to the shaft of the garage door, mounted off to one side instead of in the middle of the ceiling in front of the door. This direct-drive technology, called a jackshaft, means that the LiftMaster 8500 is much quieter. There are no clanking chains or loud motor noise, only a quiet hum and the sound of the door sliding up in its tracks. 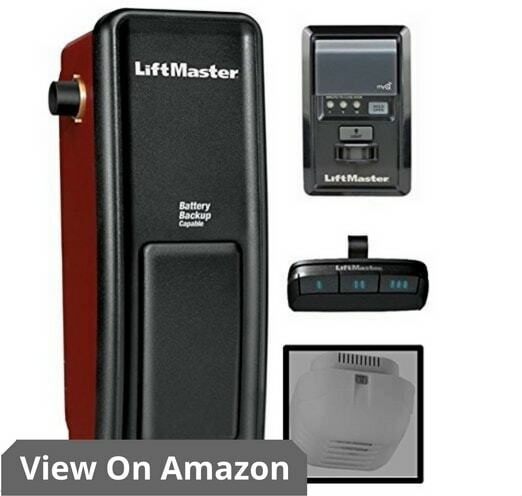 The other thing that the LiftMaster 8500 Elite does differently than a traditional garage door opener is connectivity. The unit and its accessories are all Internet-enabled, which allows the user to open and close the doors on their phone or browser. Whether or not those options appeal to everyone, LiftMaster tried. They spent time thinking about what a garage door opener could be in the future when everything in your home might be controlled through your smartphone and then worked to integrate your garage doors into the system. 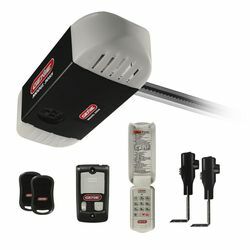 Regardless of the software, the LiftMaster 8500 Elite is a quiet, powerful, innovative new take on garage door openers. Make sure to check the balance of your existing garage because it needs the tension or cables adjusted. 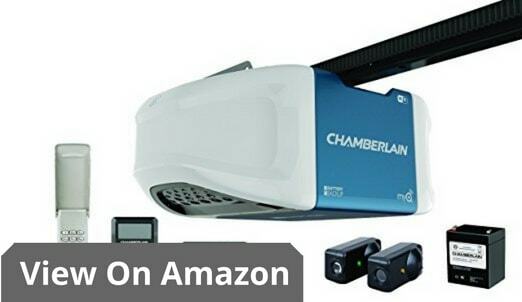 Chamberlain WD1000WF is a belt-driven garage door opener. With a 1-1/4 HP motor, it can lift almost any residential garage door. The motor is covered by a lifetime warranty. The built-in internet connectivity allows you to monitor and operate their opener from afar using your Smartphone. Even with the online video, the instruction isn’t 100% clear in certain areas, making installation taking much longer than suggested by manual. 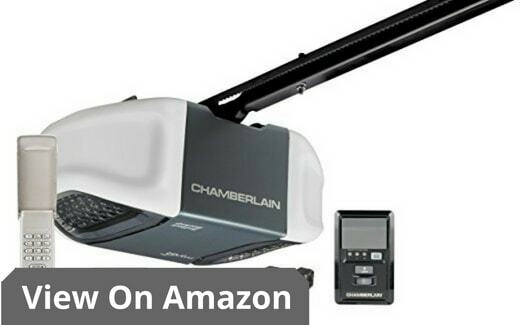 For unbelievably quiet and smooth garage door opening like no other, the Chamberlain PD762EV 3/4 HP Heavy-Duty Chain-Drive Garage Door Opener is the one to use for utmost satisfaction. It’s powered by powerful 3/4 hp motor and as such strong enough to lift even the biggest and heaviest garage door with relative ease. It incorporates Motor Vibration Isolation System that effectively eliminates powerhead vibration hence offering quietness when in use as well as prolonging motor and chain for years of trouble-free use. Safety wise, the Chamberlain PD762EV garage door opener is up to the mark since it comes with 2 x 100-watt security bulbs for illumination purposes to prevent unnecessary accidents around the garage door. It’s equipped with Protector Safety System sensors that detect obstructions and in the process will reverse a closing door and switch on the security lights so that accidents can be avoided. Comes with 2 x 3-button remote controls that can be used to open 3 garage doors simultaneously (if any). 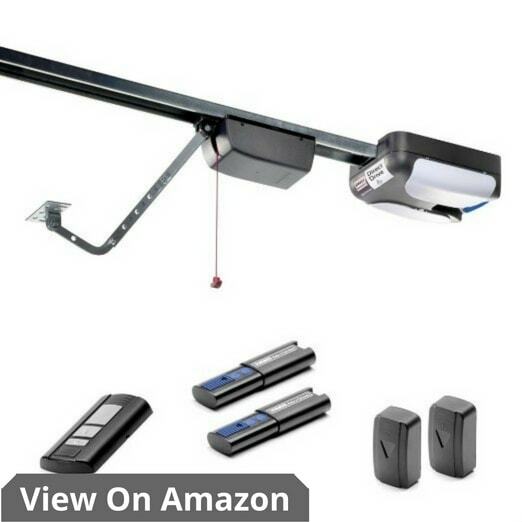 When it comes to installing the Chamberlain PD762EV garage door opener, it can be done rather easily without the need to waste money employing any contractor since it comes with quick-install 5-piece rail system so anyone at home can do it with the proper tools at hand. 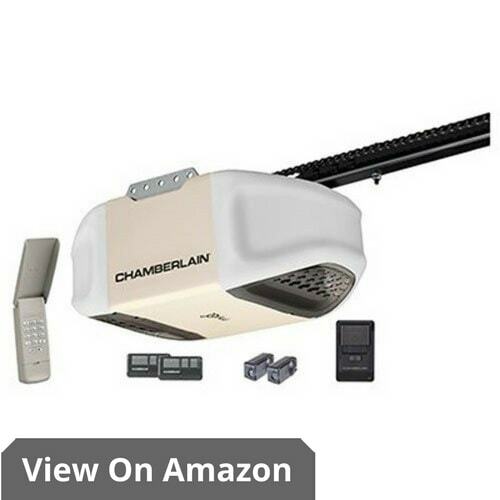 Chamberlain PD612EV is an affordable garage door opener, with the price below $200 which is pretty impressive for a keyless entry garage door opener. Even less expensive, this model has nice features such as quiet operation and MyQ connectivity. 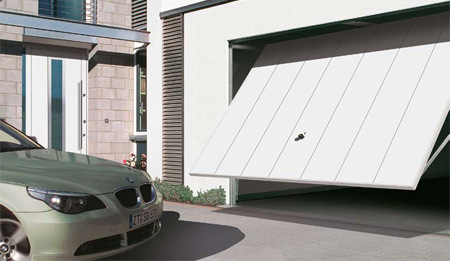 With a 1/2 hp motor, it can lift typical residential garage doors that weigh up to 300 pounds. It’s chain driven and runs slightly louder than your average belt-drive system. Its industrial strength chain is very durable. Chamberlain PD612EV can provide 200 watts of light when you arrive home so that you aren’t fumbling around in the dark. 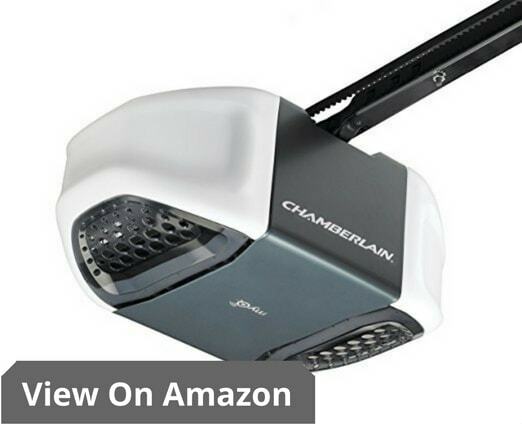 This Chamberlain Chain Drive garage door opener comes with 2-year parts warranty and 10-year motor warranty. Compared with some other models from Chamberlain, the PD612EV lacks some features like battery backup and motion sensors. 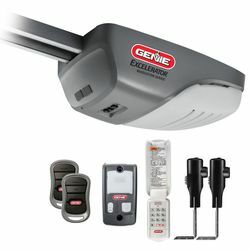 Genie SilentMax 750 is another belt driven garage door opener.It has a powerful 3/4 motor and can lift a 7 foot garage door up to 500 pounds in weight.It’s packed with a number of convenience features for automatic and remote use. It’s HomeLink and Car2U compatible so you can seat in your car controlling the garage door. The SilentMax 750 comes with a multifunction interior wall controller, two pre-programmed vehicle remotes, a wireless entry pad, but there’s no battery back-up. The Genie Exceleartor is a screw-driven opener. It opens and closes at a fast speed, perfect for people with busy lifestyles. It’s maintenance-free and very easy to install. Great safety features include using a infrared beam that will open or close the door if a person/car is getting to close. It’s a bit of a challenge to find the best-rated garage door openers. In the last few years, the garage door opener market has changed dramatically and become surprisingly complex. Features such as battery backup, timer-to-close, and home-automation system connectivity make garage door openers even more convenient. Best garage door openers should be quiet, durable and maintenance-free. That means once you install your opener, you will never have to think about again. We used these factors to rank the top garage door openers: Quality, Long-term performance, Power & Drive, Controls, Safety & Security, Driven Systems. Belt-drive openers use a metal-reinforced rubber belt instead of a chain to move your garage door. Although a little pricey, they are the quietest garage door openers and can be used for a garage attached to the house. Chain-Drive openers are also very reliable. They use a chain looped around a rail to pull (or push) a trolley that moves your door up and down. They are more affordable but tend to produce more noise, which can be a concern for garages that are attached to the house. A screw drive garage door opener operates with the rotation of a threaded steel rod which moves the trolley used for opening or closing the door. The best thing about this type of door opener is that it uses a lesser number of parts than the chain drive and belt drive, thereby requiring the least maintenance. The disadvantage is the noise that they produce. These are less noisy than chain drive garage door openers, but not as quiet as the belt driven door openers. LiftMaster 3240 is a very good model of screw drive garage door openers. Your garage door opener horsepower determines its opening/closing speed, overall durability and the size of the door it could lift. Standard single-car garage doors measure 8-10 feet wide, 6-8 feet height. Garage door openers with the 1/2-horsepower motors are best suited for standard garage doors. If your garage doors are oversized, large, and heavy, you will need an opener with 3/4 horsepower. The 3/4-horsepower garage door openers are capable of lifting wooden doors up to 550 pounds. They are expensive but will last the longest and provide the best long-term outcome. Modern garage door openers have multiple control options. They come with a keyless entry pad that mounts outside the garage door so you can enter garage pushing a big button to open the door. Some garage door openers offer keyless entry and multiple remotes, making things even easier! 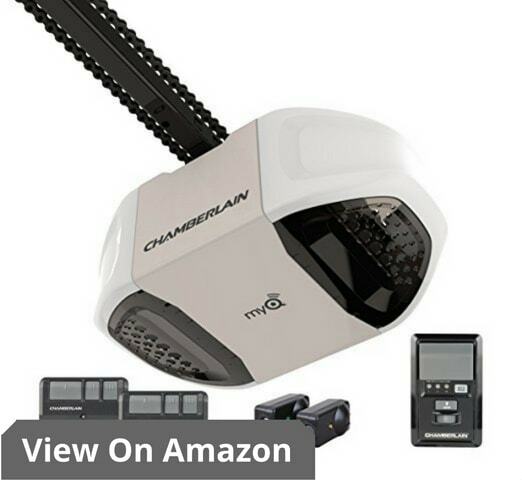 Wifi garage door openers, like the Chamberlain WD962KEV and Chamberlain Group WD1000WF, connect directly to your home Wi-Fi router, allowing you to close your garage door from a remote location through a MyQ smartphone app. MyQ app allows you to monitor and control your garage door. It will send you notifications and alerts when your garage door has been activated. Safety features are very important since most garage doors are very heavy, which can cause serious injury and even death. Modern garage doors come with safety sensors. The safety sensor projects a beam of infrared light covering the width of the door. It prevents the door from closing if an object is detected blocking the door. So it’s important for the garage door opener to have the capability to automatically reverse. Rolling code technology is widely used in garage door openers to help prevent criminal activity. This technology randomly changes the codes on your garage door opener after every use to prevent an eavesdropper from listening in to your transmitter’s signal and then playing it back later to open your garage door. If you are looking for a belt driven system over a chain drive one, then something like the Chamberlain WD832KEV is a great choice. A modern belt drive system offers an almost silent operation, so if noise, or lack of, is a requirement for you then this is the type you should be looking for. The WD832KEV still offers a lot of power and incorporates a 1/2 HP motor that will lift and lower the garage door effortlessly. These are the main elements you should look for in a garage door opener. There is a wide range of models available, all catering to different requirements. So you will always be able to find one that matches your needs perfectly.